^ Governments of United Kingdom of Great Britain and Northern Ireland, Federation of Malaya, North Borneo, Sarawak and Singapore. 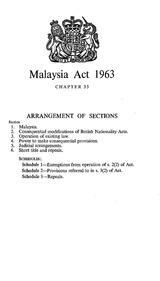 Agreement relating to Malaysia between United Kingdom of Great Britain and Northern Ireland, Federation of Malaya, North Borneo, Sarawak and Singapore. 维基文库. 1963: p. 1.